Paintball invitations – 3 places you can get them for free! Paintball is growing rapidly amongst all age groups, and for that reason we are seeing increasing amounts of parents and kids asking us to host paintball parties. I can remember one of the most exciting parts of organising a party when you were a kid, was going around at school (or your workplace if you are a big kid) and handing out the party invitations to build the excitement. The impact is much greater if your invitation is well designed, which is hard if you are not a graphic designer. 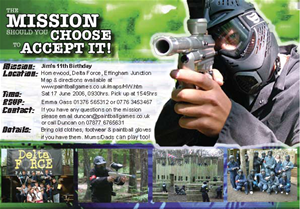 So in this article I will outline 3 places that you can get well designed paintball party invitations for free. If you type “paintball invitations” into Google there will be thousands of websites that will be returned in the search results with a lot of them allowing you to download free templates for paintball invitations. One website that is offering a free paintball invitation is hooverdesign.com. You can download a simple PDF, and alter the details, then print it off to hand out. Invitations from these types of websites will do the job, but tend not to be the best quality as they are free. Like the above example if you searched on the internet you would come across some websites selling invitation templates and some others giving them away for free. If you come across an invitation that you like one way to get a copy of it is to simply use the Print Screen button in the top right hand corner of your keyboard, and get a copy of the invitation that you can import into a website like Microsoft Paint to alter and then print off. The largest paintball companies will host hundreds if not thousands of paintball parties each year, so a lot of them professionally design paintball invitations that you can download and modify to hand out to your partygoers. 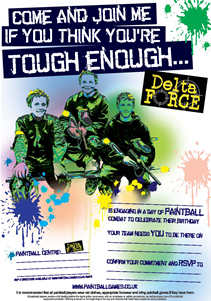 On our website we have 3 separate paintball invitations that you can download and use. I have placed some images below. If you use these 3 methods above then you should have no trouble in locating and downloading paintball invitations that you can hand out to your partygoers. The quickest and most effective method of the three will be visiting company websites and downloading professionally designed invitations for free. To download one of our vouchers for free, visit https://www.paintballgames.co.uk/the-paintball-experience/forms-downloads and take your pick.